Training with Whisper during the summer months will be more than enough to prepare you for the XC season ahead. During the first half of summer training, we will spend two days each week running, with a day of aqua-jogging and cross-training in the middle (Wednesday's). It can be very exciting to be surrounded by so many talented and fast runners at practice, so be sure to be smart while you're away from practice. June: Consistent attendance at Whisper practices is paramount to your progress. If you attend practice on a regular basis, then you can consider running an extra day each week when you're away from Whisper training. July: This means four extra runs during the month of July - one for each week. Keep the runs around 20-25 consecutive minutes, learning what "consecutive" means. It means to be consistent, steady, and patient. If you feel eager to run fast, do so at the end of your run when you can see the finish. August: Regardless of whether or not you were able to get in an extra day of running each week during July, August is the perfect time to begin or continue that third day. If you ran three days, consider adding 5-10 minutes on your runs. If you were not able to get in the third day, then consider reaching out to a teammate so you can tag along. Keep in mind that during our group practices, we will run approximiately four to seven accumulate miles. Choosing one consistend day each week to run onyour own will be to your beneift. If you choose to run an additional day during the week, be mindful that you could be running on back-to-back days, so proper shoes, adequte sleep, quality foods, and appropriate rest the next day is imperative for your growing and recovering body. These runs are totaly optional. Always run with a partner. Always. Headphones are a "no no" at Whisper, for both safety and running efficiency. Summer Training with Whisper during the months of June and July consists of runs twice each week, with a day of cross-training in the middle (Wednesday's). This amount of training is certainly enough to condition your body for eighth grade cross-country. However, if you ran during the 7th grade year and really desire to improve your time from last season and achieve your new goals, then you could be ready for an extra day of training outside of Whisper practice. First week of Whisper practice was outstanding! So many runners from throughout the Vancouver-metro area - what a delight! Keep in mind that during our group practices, we will run approximately four to seven accumulated miles. Choosing one consistent days each week to run on your own will be to your benefit. If you choose to run an additional day during the week, be mindful that you could be running on back-to-back days, so proper shoes, adequate sleep, quality foods, and appropriate rest the next day is imperative for your growing and recovering body. June: Because of the number of kids still in school during the first week, there is a good chance that many of you ran a total of three days (at Whisper practice), while others ran a total of four. Likewise, some runners were able to take advantage of the aqua-jogging and cross-training once, while others were able to do so twice. Regardless, you've begun, and now you're ready to to begin taking on an extra day of running now that July is near. July: Make a concerted to get in one run on your own each week this month, hopefully doing so on soft terrain. The runs should be 20-30 consecutive minutes, or around 3-4 miles. Keep it fun. Keep it social. Wearing a timing watch is optional. August: By now, you should be in pretty good shape and ready for XC to begin! If you are recovering well after your runs and not feeling any post-run soreness, feel free to add another 5-10 minutes to your runs. Headphones: A Whisper Running "no no" for both safety and running efficiency. Always run with someone. Always. Abby (left), Callie (in blue), and Chloe, (in red) will all be moving onto high school this coming 2018 season. Going into high school cross country, you'll want to be careful not to take-on too much mileage too soon. The largest factor in training is your history - how many consecutive months you have actually been training in the last two calendar years. And by training, one must question the quality of training within your previous middle school program. If you are coming from a program without much guidance, thus not much actual training in the form of tempos, intervals, hill repeats, steady runs, etc., then you'll want to consider a very conservative approach to reduce the chance of an overuse injury. June: Begin June with the simple two days each week with Whisper. If you were able to attend the two days in the pool that consisted of aqua-jogging and cross-training, then you'll likely get over the initial soreness faster than those who were unable to attend. Regardless, consistency is essential, so running twice a week with Whisper can really help with the beginning steps of creating a base for July. July: In early July you can add a third day of running 25-30 minutes on your own (outside of Whisper - with your HS program or with friends), then by late July be up to 30-40 minutes on that third day. Between the practices at Whisper and the third day, you'll accumulate 15-18 miles in a week. The pool workouts will be you bodies best friend. Here, you'll circulate blood flow to all of the sore areas, promoting healing and recovery. Win-Win! August: Once August arrives, you should be ready for a fourth day of running. The third day should remain at 30-40 minutes, and the fourth day should be 20-30 minutes, again depending on your history - be conservative, humble, and smart. These runs on your own should be steady runs and nothing extreme, like intervals. Keep them low-key, fun, and with your teammates. It might also be a good idea to alternate days of wearing a timing watch one day, then not wearing a timing watch the next. If you experience soreness that seems to not go away, then consider taking an extra rest day, or backing off on the fourth run (reducing the time on the fourth run). For example: if you run Monday, Tuesday, Thursday, Saturday, and you're achy on two consecutive Monday's, then back-off on one of the previous runs, yet still aiming for four runs in a week. Of course, this advice is provided you have a solid pair of running shoes that are "Coach Approved." Most importantly, never hesitate to contact Coach Dave if you have any questions about your preparation for the season ahead..
Summer Training Info Night - June 5, 7-8pm at Clark College in OSC 128. Highlights of the 2017 XC and 2018 TF seasons. Statistical data supporting the purpose of preseason training benefits. Learn about the 8-9 week 2018 summer training plan. Receive the summer training calendar. Enter a drawing for prizes including Whisper shirts, gloves, and gift cards! While you're here, please fill out the runner contact form so you can remain connected with important updates within the world of Whisper! Looking forward to seeing all of the current Whisper runners and meeting many new faces! Concentration games such as Jenga can cuiltivate greater attention span and focus. Keep games light and fun for maximal results. If there is one topic that gets lost in the shuffle of Sport Psychology curriculum, or even discussed at a team practice, it’s the topic of Concentration. It’s easy to discuss goals, perform visualization, or even say to an athlete “Focus!” But what does “focus” mean, and how do we get better at it? The importance of concentration is most valuable for runners when finding their perfect gate within peak performance. The discipline it takes to sustain a fast, uncomfortable pace makes it easy to back-off, but what we really need to do is focus with greater intensity. Here are a few fun exercises you could play at home, and others to encourage your children to perform on their own. Board games or concentration games such as Jenga, or even blindfolded Jenga. Learning or playing a musical instrument. Brief bouts (starting with once daily for even just a few minutes) of meditation. Completing a Concentration Grid, Sudoku, or Crossword Puzzle (remember those?). Reading (any form of literature, but it helps if they enjoy what they’re reading). Cleaning any room for that matter! Screen time, such as video games, television, iPads, iPhones, etc. One of the beautiful benefits of keeping children engaged with healthy habits such as sports, recreations, or hobbies, is it takes away opportunities for lesser healthy habits to become part of their daily routine. To draw your family closer, meanwhile strengthen a child’s ability to concentrate, is by setting a family goal of forbidding any screen time during the evening hours, particularly before bed. Not only is this good for the brain (development), but it will help everyone sleep better, and whatever was performed the night before (reading, homework, fun games, etc.) will be retained into long-term memory storage. Recently I was told a story of a young girl participating in the high jump during the 2017 track season. As the young girl approached the high jump bar, she would stop, turn around, and approach it again, only to repeat this action until time was up, leading to a scratch. Three scratches later and she had a "no height" beside her name. She left the event, walked to the infield, sat down, and began crying. Fast forward to last week where a runner from Whisper inquired about performance nerves, wondering how to remain focused under pressure. A multisport athlete, her confidence wanes as intimidation grows as events and games near. Admittedly, this runner “got a little mental” thus inhibiting full potential in performance. Stories and events such as these quickly remind me that our kids are kids, and as talented as they are, they are also human, filled with feelings, thoughts, emotions, and passion. These factors can easily be overlooked by focusing only on the physical aspect of training, meanwhile ignoring the human element within training and performance. There are several ways we can work though these sorts of performance anxieies. Over the last couple of weeks at practice, we have talked about focus, concentration, and goals, which can help provide a centered-focus during practice interval work, and ultimately, racing. Last Saturday, we did a brief meditation session, focusing on breathing and Progressive Relaxation Training exercises. Another strategy regularly discussed at practice is the use of “flushing the toilet,” which is an idea cultivated by Ken Ravizza, a Sport Psychologist at Cal State Fullerton. Ravizza’s flush enables one to flush out negative thinking, only to then bring in fresh, concentrated thinking for the present task, i.e., the present interval. It’s a concentration/focus strategy that encourages rational, goal-centered thinking in the present moment. Like most things in life, these strategies are actual skills one can acquire and practice over time, being sure to take a baby-step approach toward skill confidence. The first step is creating a goal, and as previously stated, we have worked heavily on the skill of Goal Setting. If your child has not yet set a goal for the 2018 track season, be sure to check out the Winter Training Sport Psych Implementation blog, which provides a summary of the first six weeks of training, as well as a brief discussion and example of what Goal Setting looks like through the lens of Coach Dave. Every runner has their own lens, so the example on the blog can be modified to fit ones goals and personality. Week 1: I’d love to say the energy was palpable, but it’s been this way every week. The kids started with a bang and haven’t slowed down. We did a solid workout at McKenzie this week, performing eight 300m + 100m intervals with calculated rest intervals. Little did they know, we’d perform this same workout in during week six to assess and discuss the progress made to this point. Week 2: This was the first week we began connecting the body with the mind. On Tuesday night we used a metronome set at 180 beats per minute to emphasize stride frequency, meanwhile highlighting the importance of how the foot should strike the ground upon landing. The 180 beats per minute is a standard cadence for strides per minute during fast interval work. Combining foot strike with the metronome cadence was pretty advanced, but I think the kids got it. Week 3: Thursday night the kids ran fifteen 200m repeats while being video recorded from the side to assess gate. Gate includes foot strike, hip placement upon foot strike, torso posture, and arm swing. Analysis starts at the feet and goes upward through the body, so providing cues about foot placement and hip placement tends to trickle upward through the spine. A few tinkerings down below (the feet) can fix a lot of things at the top (shoulders, head, etc.). The following practice, on Saturday, we spent the first 30-minutes reviewing the video so all of the kids could see themselves on film. This video is also posted on the blog. Week 4: Tuesday was a pretty good track workout, followed by a 600m time-trial. I had talked with Pacer Hillary earlier in the week to discuss the idea of running the time-trial, but I didn’t want to waste a practice only running a single interval. Also, it’s important that the kids learn how to run on tired legs, much like what they’ll experience around lap 3 of the mile, which is why we did the workout prior to the 600m. I’m pretty confident in saying that every runner ran at, or 1-4 seconds faster, than their pace of their fastest 800m from the 2017 season. Reflecting upon that now and it just seems crazy, but it also tells you of the untapped potential in these kids – what they’re missing out on (being pushed) and learning to work harder at running than they ever thought they could. Super cool stuff! Week 5: With faster racing times comes faster intervals and on Thursday night we ran a 200m, 600m, 400m, 600m, 200m. My thinking behind this workout was to mimic the speed of what I think is their current goal mile pace might be. They struggled, but I think they learned a lot when we discussed this workout the following practice when we brought up the sport psych topics of Focus and Concentration. Week 6: Thursday night we repeated the week one McKenzie workout, 300m + 100m, which the kids destroyed! Across the board, the groups ran faster, while some kids moved from Team Awesome (Hillary’s group) to the middle pack with Pacers Alex and/or Paige. We also had a few runners from Alex and Paige’s group join Pacer Micah/Braeden’s group, which was pretty darn special! On Saturday (2/24) we began practice with a discussion around the topics of Goal Setting, Focus, and Concentration during practice, and what that means in competition. This leads us into week seven. The team meetings are the most opportune time to get us all on the same page when it comes to implementing the sport psych stuff – Goal Setting, Focus, Concentration & Meditation. Though we spent 35-minutes on these topics, the meeting could have easily gone another hour. The use of a flashcard is an excellent way to begin the goal setting process, which can lead to enhanced concentration and focus during practice and competition. This past week the kids were provided flashcards and asked to create three goals for the track season ahead. For events over 400m, they were asked to include paces (per 100m, 200m, or every lap) so they can begin connecting the dots between practice goal paces and race goal paces. It can feel as though I’m speaking Greek in these meetings, so I’m posting an example of what these goals can look like on the flashcards. An example of Coach Dave's goals. Keeping these goal cards in a place where the kids will look frequently – on a mirror, in a wallet, on a wall – can help with ones in-race focus, which is the primary objective. As a finishing note, it’s important to ask your kids about their goals. Doing so reinforces their commitment to running, as well as your commitment to their success. Also, it’s important to help them through adversity. Not every runner will accomplish their goals (remember, it took Shalane Flanagan 17 years to finally win the New York Marathon), so helping them revise their goals early in the season can help with any frustration. Knowing their goals will also give you something to calculate when you're cheering them on from the sideline, providing some sense of what they might be thinking and experiencing during their race(s). If you find yourself in-over-your-head around the discussion of their practices, their performances, their goals, etc., never forget that I am their coach and their goals are also my goals. I want to encourage you to reach out to me at any point in the season if your child is struggling with anything related with their sport/event. On the flip-side, I also want to hear about their successes, so I can help reinforce the connection between their hard work and their earned results. Uploaded by Whisper Running on 2018-02-04. Sorry about the background noise. This practice provided an excellent opportunity to record some of the runners during Winter Training. The workout was 15x200m with 60-second rest intervals. We spent the next practice in a classroom so the kids could see themsevels on the big screen to better internalize how they run and how they can improve. From there, we went straight to practice and tried to practice some strategies aiming to improve gate. The incessant stream of thoughts floods my mind as the racers go flying by. Underestimating the field and under-appreciating the fluid form of the front 50 runners and how they make their pace look so easy, I can’t help but think my runners should be here by now! Abby runs distances like a sprinter – aggressive. Her form needs some tinkering, but the girl can fly! On this day, she looks fast! Her place in the pack – the top 100 – was unusual, but her feet spent little time on the ground, something I noticed during the warm-up. When she races, you’d be shocked to know she is only five feet tall. I was standing at around the 1200m spot, where I was expecting to see Kira, then Abby. After seeing Abby, Kira flies by seconds later. In the midst of this chaos, those moments seem to take minutes. All I can do is continue to encourage, but Kira looked stressed at that time. One of my key factors in training is to always remember that these are kids I’m training, not adults. They’re kids! With one exception, this team is a group of middle school runners – kids. Asking one runner, a middle schooler, to take on the responsibility of leading the group through the first two kilometers was a tall order, one we spent the previous four weeks rehearsing. 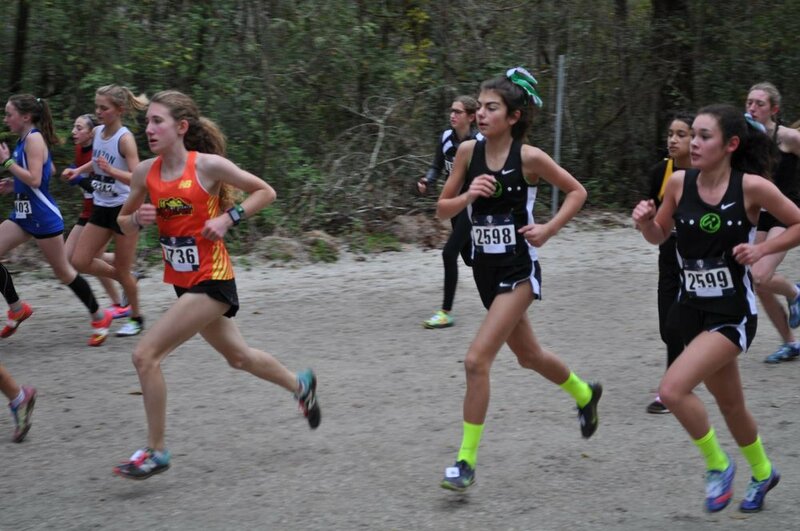 Abby, Kira, and Katelyn were to run shoulder to shoulder, with Kira bring our barometer - the pace-setter in the middle. She was to govern the pace for the first two kilometers, or for as long as possible. Soon after Katelyn, Callie and Ashley raced by, quickly followed by Emily, Kiley, and Candi. Kiley looked less than pleased. The race was fast and I could only wonder how she was feeling. Encouraging her was all I could do. Along with coaches and spectators, I raced to the other side of the double-looped course in the opposite direction of the runners. It was during this moment, where I was seeking a good position to see the girls, that I began to question myself as a coach. Reflecting on workouts and miles run over the last six months. Reflecting on pre-race pep talks from this race, and others. Were the workouts too much? Was the mileage too little? Were their psyches too worked up or were they asleep at the wheel? Sprinting my way back to the other side of the spectator path, nearing the 3200m mark, I took a peak at my watch as Abby raced by, “12:15-ish.” This can’t be right. She’s running sub-16 pace, with her previous 4k at 16:40. Kira right behind her, and Katelyn not far behind, I began jogging toward the oncoming runners. Callie, Ashley, Emily, and Kiley zoom by, and like all the other coaches, it was then a mad-dash to the finish line. Missing Abby’s finish and knowing my watch was a few seconds off, I asked Fiona, Kira’s mom, “What did you have for Abby?” “I didn’t catch Abby’s time, but Kira was around 15:35,” she replied. Wait, what? Are you kidding me? Did I miss the entire race? This whole time, I had been questioning every decision I have made since last April, and now we might have three girls running huge personal best times? Far off, up the hill, Callie is seen controllably-uncontrollably sprinting down the hill, bobbing and weaving through the foot traffic. Soon after, the rest of the Whisper crew scream by. Six personal best times of the eight runners in one day. On the right day, at the right time. It appears I should have remembered our mantra: On this day, everything went alright. This degree of self-doubt, I'd imagine, is what most passionate and involved coaches must feel, no matter if the race is at the start of the season or the end. It's healthy, so long as there is balance, self-awareness in program design, and a willingness to continue learning - this includes learning from the good races, as well as the not-so-good. The kids put in some grueling workouts between November 18 and December 9, each workout aiming toward one common goal - Nationals. We all knew the kids were talented and could run fast. It merely came down to knowing how to run, and run well at the right time. Putting small bits of controllable energies into play, and doing what we've trained the bodies to do, which was to run fast, implementing a plan, and staying awake at the wheel. Not two hours after the race, one parent asked about the team plan for 2018. Although I said that I am trying to enjoy the present moment of earning 13th place at Nationals, my mind had already begun thinking of the kids lined up for next season, and it'll be just as eventful. To all the coaches and runners: Here's to a healthy amount of self-doubt and the beautiful reward reaped through patience, perseverance, and believing in yourself! Whisper Runners, Katelyn, Ashley, and Candice. Whisper Runner, Abby and her mom, Katina. Whisper Runner, Callie, and her dad, Levi. Whisper Runners, Kiley and Candice. Before the start of the USATF National Junior Olympic Race in Tallahassee, Florida on December, 9, Whisper Runners, Kira, Abby, Ashley, Kiley, Katelyn, Emily, Callie, and Candice pose for a timeless photo. For more pictures from the Association, Regional, and Nationals meets, check us out on Facebook at https://www.facebook.com/whisperrunning/.